In 1973, Clifford A. Kaye of the U.S. Geological Survey was apparently the first coastal geologist to suggest to the Island as a whole that it stop thinking about how to prevent erosion, and in many cases start thinking about how to let it happen and back away from it. This counsel is fundamentally different from what coastal geologists and engineers were saying only a few years before, when they confidently said building revetments known as riprap could hold a bluff in place, or that setting up wooden groins could keep sand on a beach. They knew these structures prevented sediment from moving naturally down current, but most seemed to think that you could prevent the starvation of adjacent beaches by doing nothing more than dumping more sand where and when it was needed. The Gazette had been calling for something like the Kaye survey for 17 years, believing in the middle 1950s that if experts merely identified the most erosive stretches of the coastline as well as the causes, the problem could be fixed. This was a hallmark of much of the can-do, mid-century thinking about erosion — if you built something strategic and strong enough, you could take care of the issue once and for all. In 1956 Thorndike Saville, dean of the College of Engineering at New York University, took a day to tour sectors of the Vineyard shoreline with Island officials. “There are places where beaches can readily be built to a desirable width and maintained by the building of groins or spurs to prevent the lateral movement of the sand. Maintenance of such beaches may be fairly simple,” the Gazette reported. 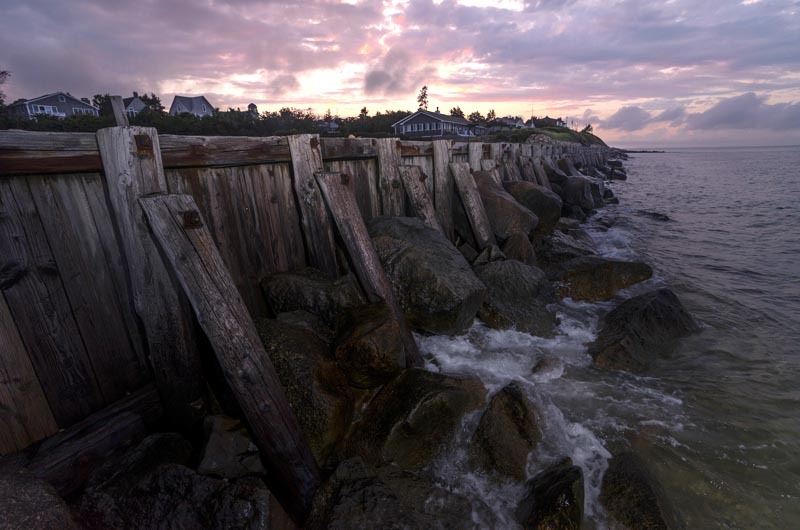 Past thinking held that strong armaments, like seawalls, could provide long-lasting protection. There were few if any regulations about building seawalls, jetties and groins along the coastline, and few seemed to care whether a given beach was natural or might wind up completely artificial. Mr. Saville was essentially advocating the creation of an engineered shoreline wherever a natural one eroded to a point where property was threatened. “If any help is to be obtained toward checking beach erosion, a survey will have to be the first step,” the Gazette said in an editorial. “This is not something that can be deferred indefinitely.” Estimated in February 1960 to cost about $20,000, the project would be shared among the towns, the state and federal governments. The editorial pointed to another fact of erosion, then and now: few individuals, and even fewer towns, wanted to deal with the issue if it was possible to put it off for a few years. Fewer still wanted to deal with the problem if it would cost real money just to get started. Until the Kaye study, coastal engineers appear to have built structures at the bases of bluffs or along beaches without giving any real thought to the consequences farther down the coast. In 1973 Ernest E. Duarte of Edgartown — a caretaker, fisherman, mover of lighthouses, setter of bowling pins, gardener and ambulance driver, among other skills — took a reporter for the Cape Cod Times to the Wequobsque Cliffs of Chilmark and showed him how great hunks of the bluffs, including a walking trail and whole stands of trees, had recently fallen 150 feet to the beach below. Mr. Duarte, a passionate critic of government at just about every level, argued that geologists who were guessing that rainwater had softened the cliffs from above were wrong. It was attack of the waves at the base that was causing the slumping, he said. Then he proposed something dramatic: A seawall that would start at Devil’s Bridge off Gay Head, sweep around the Cliffs, run the length of the south shore of the Vineyard and Nantucket, hook northward and keep going along the outer arm of Cape Cod until it reached Provincetown. Hundreds of miles, but Mr. Duarte could not understand why nobody else saw the wisdom in it. “The powers that be will not move on getting projects started to halt the loss of land,” he declared. There was a notable absence of scientific studies and analysis at the time. The Gazette generally acknowledged that the seas were rising, and that this process played a role in the retreat of the coastline. But there was a tendency to look for isolated, Vineyard-only causes and theories that erosion had begun to worsen only after a series of natural disasters befell the Island in the 1930s — first a disease that wiped out acres of offshore eelgrass beginning about 1932, then the ravaging of the Island coastline by the hurricane of 1938. In 1960, the waterfront columnist Joseph Chase Allen wondered about the role of eelgrass, kelp and sea moss that had once lain thickly on the beaches all around the Island but now were missing from the scene. “It piled into the cracks and crevices between the boulders, and having lodged in such places, it collected rubbish of every sort, including quantities of sand with which it was eventually buried. Beaches were ‘built up’ in that time and age . . . and the sand-traps which brought about the building process consisted of seaweed,” he wrote. The paper also expressed confidence in rather lacey solutions, including decorative plantings to hold terraced embankments in place (“deep yellow daylilies, periwinkle with blue blossoms, purpled-flower crown vetch and English ivy,” all endorsed by George Goddard, instructor in floriculture at the University of Massachusetts in the summer of 1960). Thinking held that beaches could be readily nourished to compensate for depleted sand. Terracing embankments to forestall erosion was also a big idea in the 1960s. At the end of the decade Georgina Reid wrote a book called How to Hold Up a Bank. The Reid book advocated bulkheading, shallow terracing and planting common reed grass (Phragmites communis) behind low terrace walls. In the Gazette story, the author took no notice of the effects of sea level rise and said nothing about what would happen to a beach below if the sediment from an embankment could be “immobilized” as much as she predicted. Ten years later, both science and the Gazette were turning a sharp corner. In November 1985, Orrin H. Pilkey Jr., a geologist from Duke University, came to the Island and explained in a lecture that the seas were rising and the beaches were rolling inland as a natural response. The seaward side of a beach erodes but the landward side builds: “In effect, the Island migrates landward to ensure its own survival,” he said. Mr. Pilkey also discussed a term still so new that the paper kept putting it in quotes — “the greenhouse effect,” caused by the burning of fossil fuels — and suggested that by 2100 nations will be worrying about the inundation of cities built along the sea. Yet he believed that the Vineyard, with its southern shoreline completely unaltered, faced a much happier future. “The Islands themselves aren’t threatened with extinction,” he said. “Whatever erodes naturally from them is either deposited on another part of them or on an adjacent island. As they diminish in one part they are rebuilt in another. The beaches are in no danger from anything except man. State administrators really know the problem, but have to tiptoe between the politicians and the facts of life. In a war waged against the sea, the sea will win. “The sandy shore surrounding an island is a single, continuous feature. Each section of [the] beach depends on and contributes to all other sections for the simple reason that the sand pebbles [and sediment] move laterally along the beach. If this movement is impeded, as by the construction of a jetty or impervious groin, the beaches on the downdrift side will, in consequence, lose sand. . . .